Anyone that is looking for authentic Greek food and a great overall restaurant needs to stop by the Tarpon Springs sponge docks and dine in at the famous award winning Hellas Restaurant and Bakery. 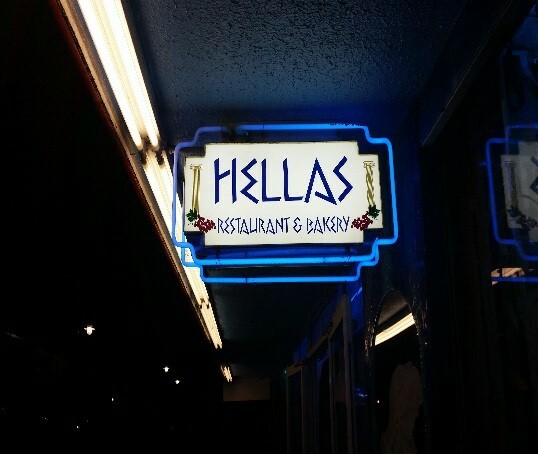 Hellas has been serving up some of the best authentic Greek food since 1979. The Tarpon Springs sponge docks is always packed with locals and tourists from all over the world. Guests are welcome to either dine inside the restaurant or be seated outside by the curbside patio seating area. Guests that choose to dine outside have the option to sit anywhere they please. This restaurant is uniquely designed. Hellas provides guests with an astonishing Greek atmosphere. They always play uplifting, smooth Greek music that will automatically put anyone in a good mood. The music is very appealing to the ears. The walls are covered in Greek murals and monuments that symbolize the history of Greece. 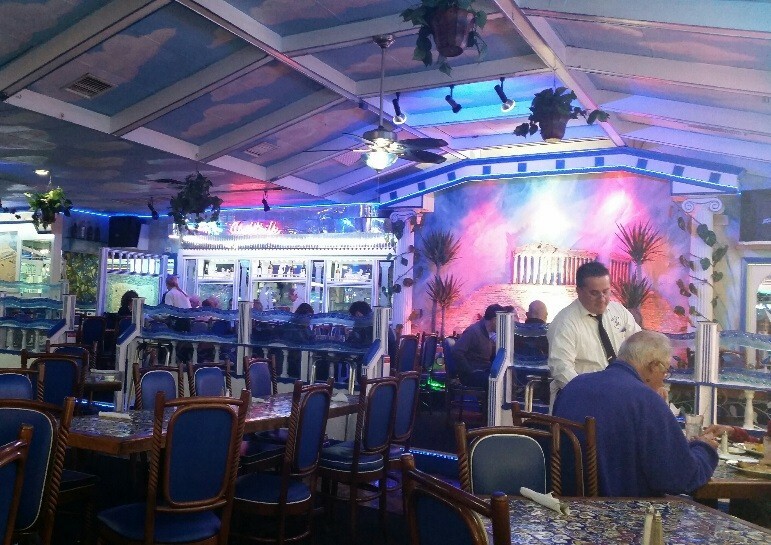 Ambient blue lights are scattered across the restaurant to create a more welcoming and relaxing experience. In addition, guests dining with a large group or single person are easily accommodated with a fast and friendly wait staff. Hellas restaurant and Bakery is the place to be for people looking for really tasty and healthy Mediterranean food. The menu has a wide range of food to select from. Furthermore, Hellas serves a lot of traditional Greek appetizers. 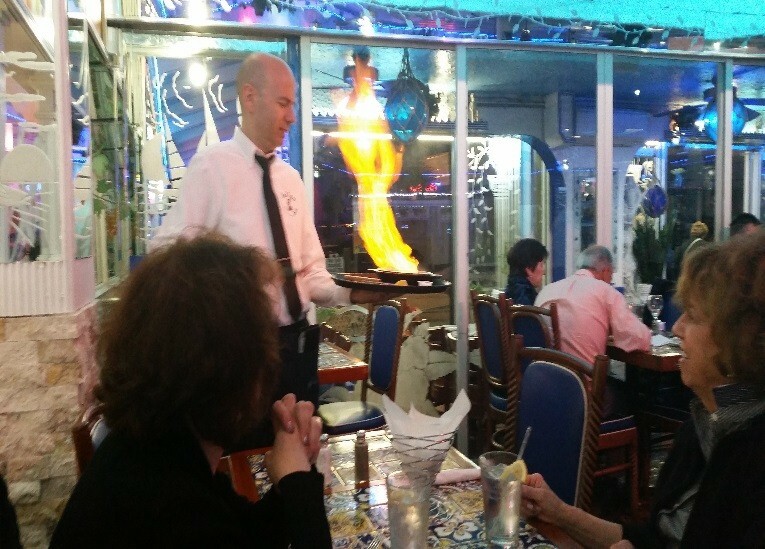 One of the favorite choice appetizers is called saganaki known as the flaming cheese. It is quite the entertainer; especially for people new to the Greek culture. The server delivers the cheese on a small frying pan then ignites the cheese into flames with an alcoholic liquor while yelling out loud “OPA”, which means hooray in Greek terms. This sets the atmosphere for kids to adults alike. Furthermore, a second appetizer that is refreshing and delightful is their delicious hortiatiki. Someone that likes salad minus the lettuce will enjoy this as an appetizer. It consists of crisp cucumbers, red plump tomatoes, thinly sliced red onions, and Greek feta cheese. The sauce is made with olive oil, red wine vinegar and garlic, and some extra secret spices. In addition, the menu contains many entrées to choose from as well. From fresh seafood such as calamari, extra-large shrimp, and a variety of fresh local fish, to a meat lover’s dream like a mouthwatering lamb kabob with grilled onions and peppers. They included some American food such as hamburgers and French fries to accommodate people who stick to their roots and are not too adventurous in terms of food. Hellas is ready to serve anyone and everyone. 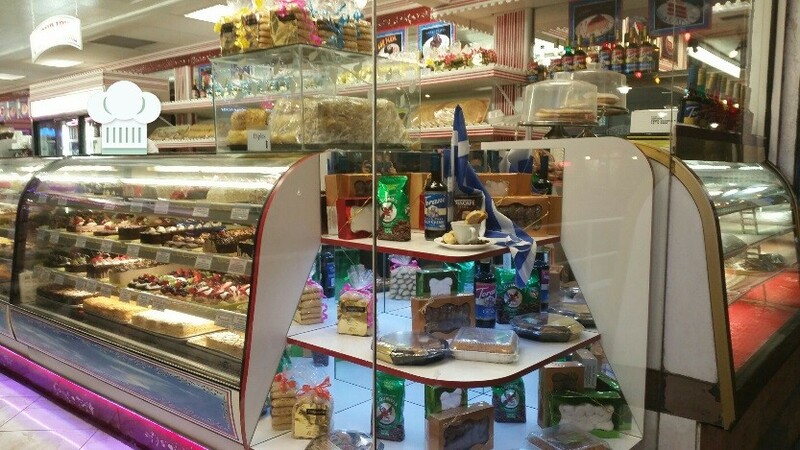 Hellas is also equipped with an appealing bakery that has an astronomical amount of desserts to choose from. 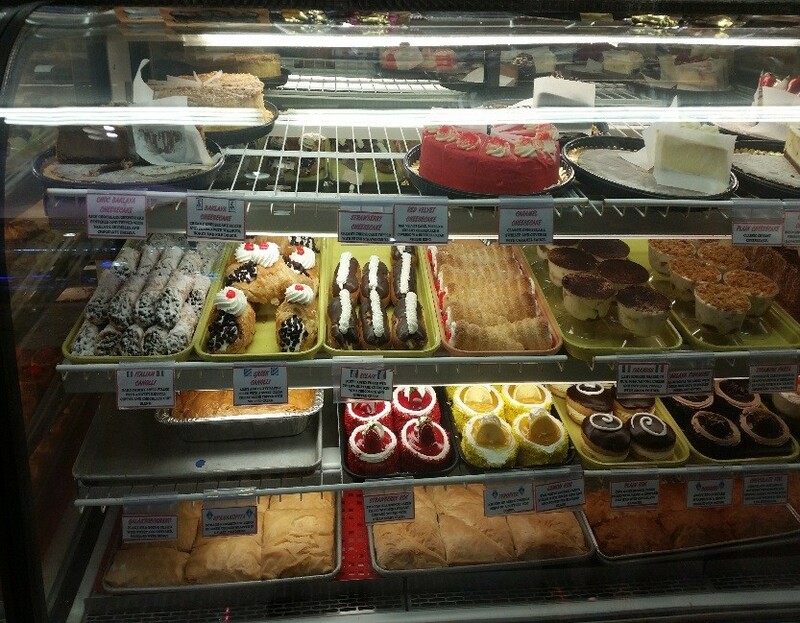 All of the pastries and desserts are made from scratch in a separate location behind Hellas. One of their original products is a Greek pastry called galakotobourko. This pastry has everything and more. The pastry is layered beautifully with light flaky filo dough and is filled with creamy vanilla custard topped with a cinnamon, lemon, and orange syrup. The employees recommend a Greek style coffee when consuming this delectable pastry. Another interesting and loved pastry is called baklava. This dessert is made up of many layers of filo dough with crunchy walnuts and a very sweet drizzle of honey. In addition, the desserts are reasonably priced. Don’t worry about wasting money on these delicious desserts. The quality and quantity will keep guests very satisfied. If in the area, remember it’s not all about soaking in the sponges when visiting the Tarpon Springs sponge docks. The main course should be soaking in the flavors of the Greek food and Greek atmosphere at Hellas Restaurant and bakery. There should always be plenty of time to be made to join in on the “Opa” celebration at this overly satisfying Hellas restaurant. Best enjoyed on an empty stomach, “Opa”!